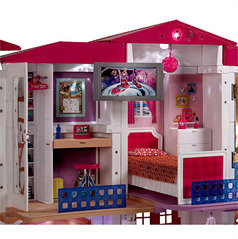 The Barbie Hello Dreamhouse is the ultimate modern update on the classic Barbie-sized two-story Dreamhouse. This dollhouse is now Wi-Fi enabled and features the trendiest home designs. A hallway, kitchen, and living room make up the first floor, and a bathroom, bedroom, and office are on the second floor. The high-tech house includes lights, music, sounds, a motorized elevator, a staircase that turns into a slide, a roaring fire in the fireplace, and even a flushing toilet. A Hello Dreamhouse companion app takes parents through the process for connecting Hello Dreamhouse to a Wi-Fi network, and allows for further customization. Once it is Wi-Fi ready, kids can play with voice commands, as the house responds to over 100 commands. Begin all voice commands by saying, “Hello Dreamhouse”, and then wait for the beep. Kids can then tell the house to open the door, turn the lights on, and even order a pizza or throw a party. The house also offers standard dollhouse play. It can be controlled manually using 13 switches throughout the house to create interactive effects like lights and sounds. No dolls are included but everything in the house was designed to play with alongside standard Barbie dolls. It comes with themed backdrops, furniture, and accessories for engaging in classic imaginative play with kids' own Barbie dolls. It's truly a deluxe item with a price point to match so keep in mind that it does require a commitment from parents for the initial setup. 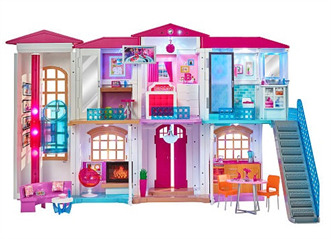 The newest Barbie Dreamhouse, the Barbie Hello Dreamhouse, is truly a deluxe house with so many fun features, and ways to engage with Barbie. With themed backdrops, furniture, and accessories for the two-story home, kids can play with their own Barbie dolls in the hallway, kitchen, living room, bathroom, bedroom, office, or in the front of the house. In addition to classic dollhouse play, this high-tech house is Wi-Fi enabled and voice activated. An accompanying app allows for more customization. Some of the coolest features include music, a motorized elevator, a staircase that turns into a slide, and a roaring fire in the fireplace. Realistic sounds include a flushing toilet, dishes being washed in the sink, a shower, a dog barking, doorbell ringing, and much more. We found the assembly of the house easy enough to complete. Using the companion app to set up the Wi-Fi was slightly more difficult but not terribly. The prompts are straightforward, and once it is Wi-Fi ready, kids can play with voice commands, of which the house responds to over 100. This is a very cool, and unique feature. Additionally, 13 manual switches throughout the house create interactive effects like lights and sounds. These can be activated by hand or by placing a doll on them. No dolls are included but kids can use their own Barbie dolls for playing. The Barbie Hello Dreamhouse is for Barbie fans ages 6 and up who have their own Barbie dolls to play with in house since no dolls are included. An adult will need to assemble the house, enable the Wi-Fi, and activate the companion app. It does require a smart device, and a commitment from a parent for the initial setup. If parents are willing to help out initially, most kids at the recommended age of 6 and up will probably catch on pretty quickly, and can then customize it further themselves if they have access to the smart device it's connected to. 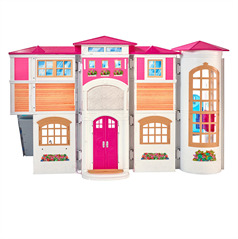 The Barbie Hello Dreamhouse is truly a deluxe item with a price point to match. A smart device is required and not included with the house. Parents will have to complete the initial setup. An accompanying app allows further customization. If parents are willing to help out, most kids at the recommended age of 6 and up will probably catch on pretty quickly, and can customize it further themselves if they have access to the smart device it's connected to. To get started, parents will have to assemble the house and apply the labels, which we found easy to do in 20 minutes using the included instructions. The house does come with a power cord for using the electronic features like lights and sounds, and it is voice activated when connected to Wi-Fi. The included booklet lists many Voice Commands, though the packaging states that the house responds to over 100 commands. It works well but kids must follow the instructions, which are to begin all voice commands by saying, “Hello Dreamhouse”, and then wait for the beep. Kids can then tell the house what they would like it to do. For example, open the front door, throw a slumber party, or get ready for school. We gave the Barbie Hello Dreamhouse a Savvy Auntie Coolest Toy Award - Toy Fair 2016 edition! 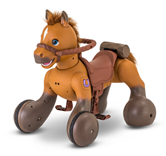 It's an extraordinary experience for any little nester who enjoys a little luxury with her playtime.